In 1973, Earl Owensby saw “Walking Tall” at the movies and was inspired. The film was shot in McMinnville, Tenn., and Owensby started thinking that movies could be shot in the Carolinas. Owensby was in his 30s and designed tools and worked as a sales engineer for a Houston-based company. He soon became an actor, director and producer, too. Owensby grew up poor in the Cliffside community, a North Carolina mill village that’s a short distance from Chesnee. He was adopted as a baby after being born to parents in the mountains. He often jokes that he didn’t finish high school, but was released before becoming a Marine and successful businessman, who owned five businesses before getting into movies. Not only did the man without any acting experience, not even in a high school play, become an actor. He changed the movie business, particularly thoughts on where independent films would be shot. Owensby went on to produce 16 movies in the Carolinas, including scenes in Gaffney, Spartanburg and Myrtle Beach. “Earl was the first outside that Hollywood mainstream to show I can do this and I’m going to do this,” Manning said. The height of Owensby’s career was in the 1970s and early 1980s. He said his films have been shown in 117 countries and dubbed into five different languages. Some are still being shown in China and India. Manning is director of university and media relations at Gardner-Webb University. He also teaches a film studies class each semester, and his students are often impressed after visits with Owensby. “The Futurist” describes how Cameron needed a place to film underwater and was approached by Owensby, who bought the nuclear plant with plans of transforming it into a movie studio. Owensby still recalls removing steel and metal from the plant and pumping water into its large concrete bowl for Cameron’s film. Owensby starred in many of his films, even though he never considered himself an actor. “I’m not an actor, but you know what I am? A salesman,” Owensby said. Owensby still owns his Shelby, N.C., studio, where he began filming in 1973. It’s down the road from Shelby’s airport in a rural residential setting. The studio is on nearly 67 acres with eight stages and a 100,000-gallon film tank with underwater camera bays. The property also has a hotel and landing strip for planes and helicopters. Owensby’s first film was “Challenge” in 1974. It was about a candidate for the U.S. Senate whose family is murdered because of his stand against the mob. Owensby starred as the senatorial candidate. Looking back, Owensby doesn’t think the movie was that good and said he wouldn’t watch it again. However, he realizes it showed that a low-budget film could make money. It made others willing to work with him and return his calls. There hasn’t been a lot of filming at the studio in recent years, but Owensby shows up to work daily. He often meets people wanting to lease the studio to shoot their own movies, but it doesn’t take long for him to realize many don’t have the funds for their ideas or understand the work involved in making a movie. “Most people want a Rolls-Royce and pay for a Ford Focus,” Owensby said. He and Sandra Owensby, president and CEO of the Senior Centers of Spartanburg County, have been married for more than two years. Sandra had never heard of him or seen his movies until they started dating. Earl Owensby tells a story about one of their first conversations. He asked what she was interested in and she mentioned style. He told her that he’d been profiled in GQ and she didn’t believe him. Owensby is proud of his accomplishments and has stories about working alongside Ginger Alden, Elvis Presley’s last girlfriend, when Owensby filmed “Living Legend: The King of Rock and Roll,” with her. The movie was based on Presley’s life. Singer Roy Orbison spent six months in Shelby staying at Owensby’s hotel while acting and recording. Owensby fondly recalls those days, but says he rarely watches his movies now. “Once I see them, I’ve see them,” Owensby said. However, he still gets excited when he sees himself on the screen. “He will tell you no, but he does,” Sandra said. She said he likes to talk about where scenes were shot and what was involved in making some movies. 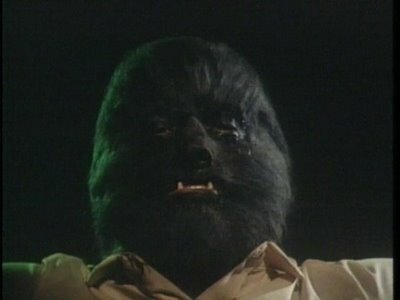 For example, it took four hours for him to get his makeup on and covered with hair during his version of “The Wolfman.” It also took four hours to remove the makeup and hair. He drove through a house at the end of “Death Driver” and stood atop a flying hot air balloon in another movie. Last year, one film was shot at Owensby’s studio, “The Story of Jesus the Christ.” The movie ended with a hymn sung by Dolly Parton. Sandra Owensby and Manning are in the process of writing a book about Owensby, which is scheduled to be published next year. Manning grew up in eastern North Carolina and was familiar with a few of Owensby’s movies, but learned more about him and became his friend after doing a story to commemorate Owensby’s 20th anniversary in show business for Headline News in 1993. “You realize you’re in the presence of a legend,” said Manning, who said his students’ eyes often light up when learning about Owensby and how he lives so close.